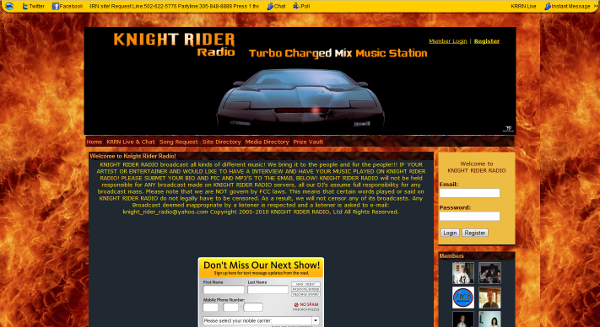 This week's Community of the Week is Knight Rider Radio, created by DJ KNIGHTMAN. If you'd like to see your site featured as a Community of the Week please post an introduction following our guidelines. 1. Could you explain what your site is about for those that aren't familiar with it? This site is a internet radio station site! 2. What gave you the idea to create a site? Was it a natural extension of a hobby or passion you already had? Well I came to Spruz when Ning was starting to charge there members and it's a hobby and a passion for music. I want to help promote artist who can't get there music heard on a FM or AM station and to be able to give my listeners a wide choice in music and entertainment to listen to! 3. Is your site a join effort between you and other co-creators, or did you create it by yourself? 4. How did you hear about Spruz? 5. What feature has your community found most useful? To be able to embed features! 6. Do you have any tips or suggestions for other site owners? Was there anything you wish you had known when you created your community that you know today? [Spruz] is a great tool to promote a business or whatever your passion is. This week's Community of the Week is FanCentral.us, created by FanCentral. FanCentral.us is a community for anyone who loves Science Fiction, Comics and/or Fantasy. Fans of any part of these genres will will find a smorgasbord of things to do, people to chat with about their interests and activities to attend. We work hard to make everyone feel welcome and keep the site safe and the content 'family friendly'. For instance, let's say you are a Star Trek fan... on Fancentral.us you will find Star Trek groups, discussion boards, events and Trek loving members to chat with! We even do a weekly podcast with celebrity guests! The inspiration for this site was our passion for Star Trek and our mutual feeling of disappointment in other Trek communities we had been members of. After careful consideration, we decided to expand content to include all SciFi, comics and fantasy genres and set out to create the best 'geek' community on the web! Yes, there are four people who came together to create FanCentral.us. We were a paying site on the NING network, but chose to move because of the direction NING was going. After a couple months of test driving the various options, we foundSpruz on a message board and gave it a try.... INSTANTLY we knew Spruz was MUCH different than the others and it was our new home! The support at Spruz is second to none...Spruz people will actually TALK to you and help you when you have a problem....and they are POLITE! The best we've found, HANDS DOWN! The feature we most appreciate, as site owners, is the ability to see exactly how much storage and bandwidth we are using at any given time. That was one of the main reasons we left NING... NING gave you no way to monitor your communities storage and bandwidth usage, so most people over paid in fear of running out. First of all, I suggest every site owner make the decision to approve new members. Since we have done this, spammers are a thing of the past and it is easy to catch internet 'riff raff' before they get on your site and create problems. Also, you need to monitor what people post on your site. Members are the lifeblood of your site, but there will always be a few that push the limits and potentially disrupt a blissful site. If you give some people an inch, they will take a mile. Finally....if there is a problem with the site itself (glitches and such), don't blow up at Spruz. Glitches happen and sites have hiccups on occasion. No way to avoid that. Simply contact the support people and I guarantee the Spruz team will promptly get back to you and work with you to get the problem resolved. They are GREAT people....please be considerate to them when problems arise. 7. Was there anything else you'd like to add? 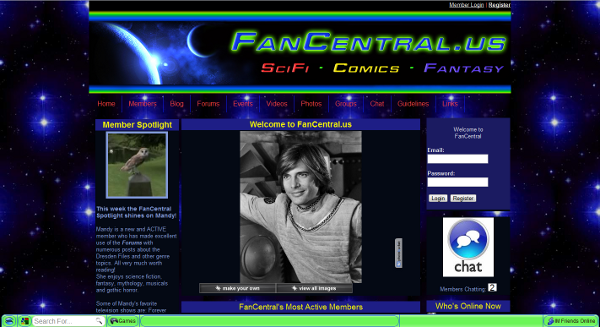 FanCentral is a warm, friendly 'geek' community with tons going on and great people to interact with! We hope to be here a very long time and look forward to new members from the Spruz network! Thanks to all the Spruz people who are constantly working to make things better for all of us. 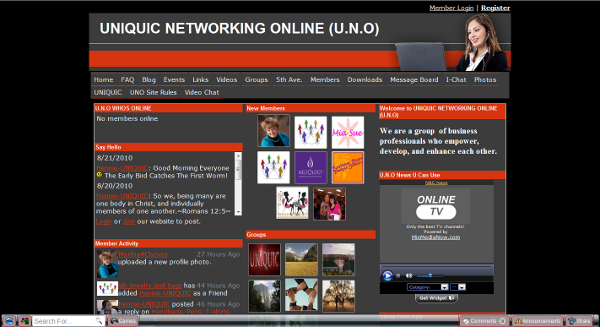 This week's Community of the Week is Uniquic Networking Online, created by UNIQUIC. We are a group of business professionals who empower, develop, and enhance each other. It was a natural part of our company, in that we offer fashion, style, beauty and health information to our clients. So creating a site to give information to our fellow small business owners wasn't a stretch for us. It was mostly done by myself with some input from my co-creator in our company. I went on a Google search and looked for a free online networking sites. Our community finds the forum we call the "Message Board" the most useful. It connects everyone together if they aren't in the same group. Some suggestions that I would make to offer site owners are to create site rules in the beginning and stick to them and to moderate all petitions to join their communities. It's like your home ie... you wouldn't let anyone come in your house who you don't know anything about. And we all have house rules in our homes because we don't want people tearing up our houses. One thing that I wish I had known was that you shouldn't be over zealous in accepting petitions and to verify petitions to see if they reflect what your community is about. I find that the Spruz Community Forum is very helpful and everyone is very nice and courteous. Thanks Spruz! Hello everyone! We're back again with our Community Spotlight, which brings something you'll probably recognize and something you won't. To begin, we've had some lengthy discussions at Spruz, the result of which was a decision to make a slight adjustment to the direction of the Community Spotlight. As you've probably realized the format has been changed to an "interview" where we ask the owner of the featured site questions which will help us learn more about their community and the work the owner has put into it. We want to hear more from our community, and are confident that others will learn from the experiences each Community of the Week. This change phases out the other features of the Community Spotlight. Now for something you're familiar with. We featured HIM Addicts last week, which was the kick off of our third round of Community Spotlights. Because that template was phased out we wanted to make sure they got equal treatment as all of our future Communities of the Week. Read on to hear from the owner, Magik. If you'd like to see your community featured please post an introduction following our guidelines. Good luck! 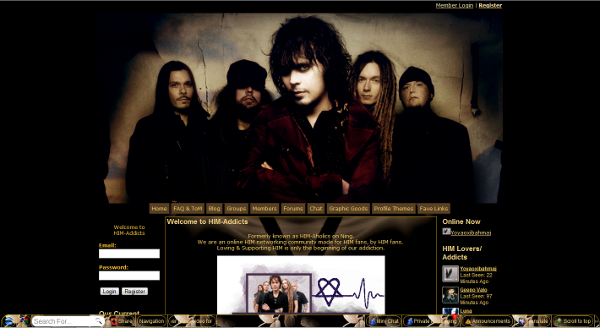 The HIM-Addicts site is a place for fans of the Finnish band HIM, where members can share news & information about the band with each other, as well as working together to promote the band. As our slogan states: We are an online HIM networking community made for HIM fans, by HIM fans. I originally created the site on Ning under a different name, a couple years ago. I was an Official promoter for the band & wanted to do something to say 'Thank You' to the band, as well as create a special place where fans could come together to build lasting friendships. Allowing members to help make the site what it is has been the #1 goal behind the site then & will continue to be 'key' for our community we now have on Spruz. 3. Is your site a joint effort between you and other co-creators, or did you create it by yourself? I originally created the site myself. I allow the other members to give suggestions on what they'd like added to the site & also allowing them control over our blogs, forums, etc., thus making the site theirs as much as it is mine. Allowing members to have say in what goes into our site is an important part of our community. I originally heard about Spruz through an email broadcast from a Ning community I was a member of. Like this other community, I was looking for a place where I could move my site & my members could call 'home'. I am happy to say I'm grateful for hearing about Spruz & taking the chance of coming here. My members, as well as myself are more than impressed with what Spruz offers compared to other network platforms. We'll be staying here for a very long time. There are a lot of features our community has found useful. Members seem impressed with the forum, which allows us to have subcategories for discussions, making it easier to share thoughts as well as news. A feature I find useful is the polls (which allow me to get feedback from our members on how to improve our site's content). Allowing your members to share suggestions for your site helps them feel more like they're an important part of your site. This also helps them understand how to use certain features that you offer. I just wish I had known about Spruz sooner than what I did. BUT! I'm glad to be here, now. Once you get started, you'll find that Spruz has a lot more to offer than a lot of other platforms. I, personally, am impressed with the support/staff here who are prompt to answer any questions you may have about building your site here. This week's Community of the Week is HIM Addicts. It was created by Magik as a community site for fans of the Finnish band HIM.. HIM Addicts are passionate about what they enjoy, and the site reflects this. You're greeted by a high quality image that serves as both an introduction for why the site exists and a centerpiece for the rest of the design. The rest of the site's design uses the same color scheme, tying everything together to make for a great presentation. As you scroll down the page it's obvious that the community comes first, which is fitting for a website. The structure of the page is inviting, and helps users understand what to do next. There are seven more sites that will be featured until our next Community of the Week voting begins, the winner of which will receive $120 worth of free Spruz upgrades and more! If you'd like a shot at our next round of rewards post an introduction that follows the guidelines we've provided. This week's suggestion comes from rwanger who would like to see the ability to allow users to subscribe to the Blog element without using RSS, automatically sending them an email whenever a new blog has been posted. Users would have the option to subscribe to the Blog feature if they like, and remove themselves at any time. As always we want to hear what you think about each idea. If you've thought of a feature you'd like to see added to the Spruz platform feel free to post it in the Idea Room. Remember to make it as detailed as possible; all topics must be approved before they'll appear. This week's tip by KuruptGaming x shows you how to add "spoilers" to a page on your website. The technique is often used by forums to hide large blocks of text or images, making pages load faster and improving the overall user experience. If you have any tips please post them in our Tips and Tricks forum!